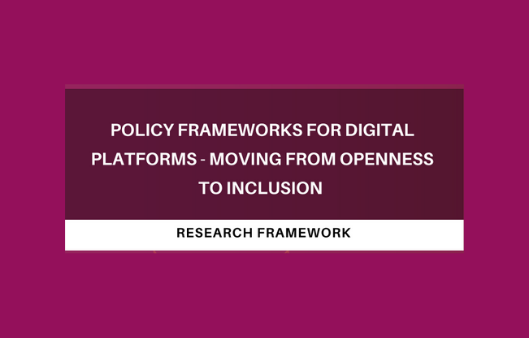 This document puts forth a research framework for ‘Policy Frameworks for Digital Platforms - Moving from Openness to Inclusion’. It outlines and clarifies the key concepts invoked in this project and offers a broad meta research framework for the project. This framework has been constructed ground-up from a synthesis of the research proposals from the network. It is intended to serve as the common basis upon which the different research projects will develop their respective research design.